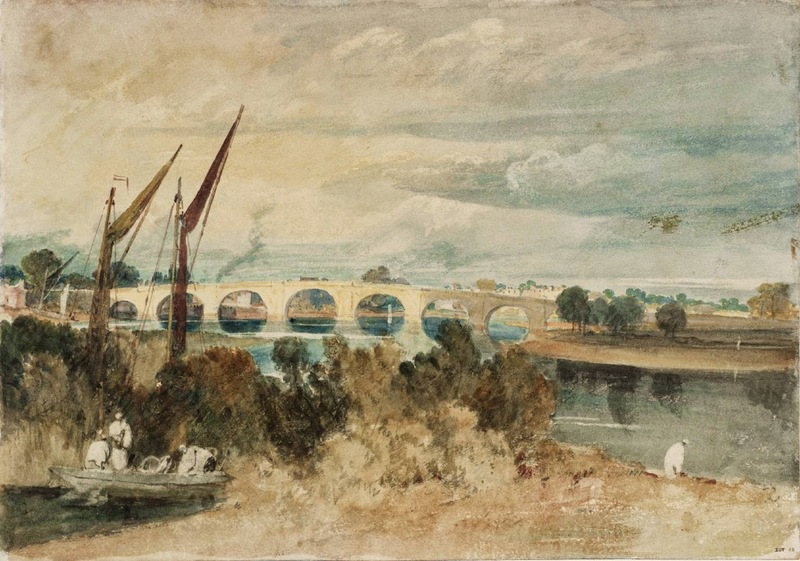 Researching this blog over the years I realised that paintings of the River Thames in London crop up on a fairly frequent basis; I have included them in my posts on André Derain, James Abbott McNeill Whistler for instance, and Claude Monet, who painted the Thames over and again, so I will only include a few representative ones by Monet here. 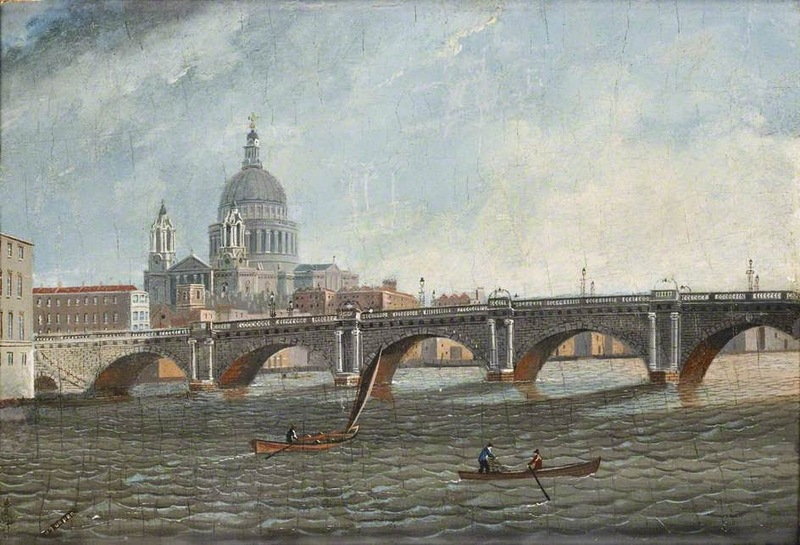 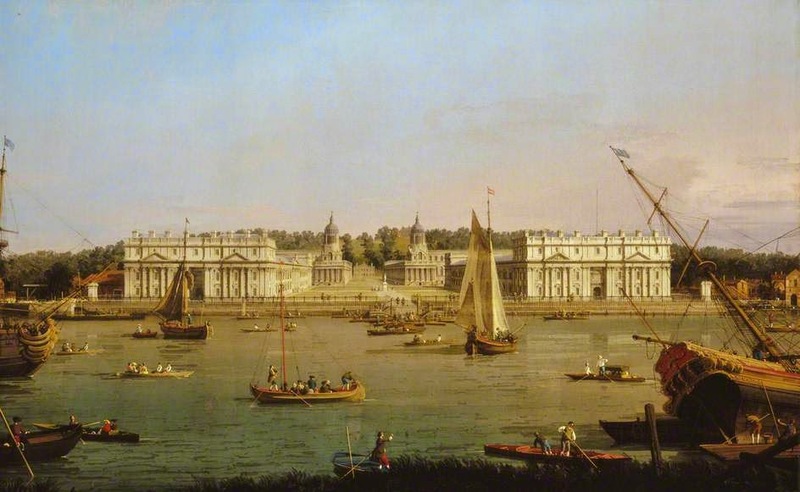 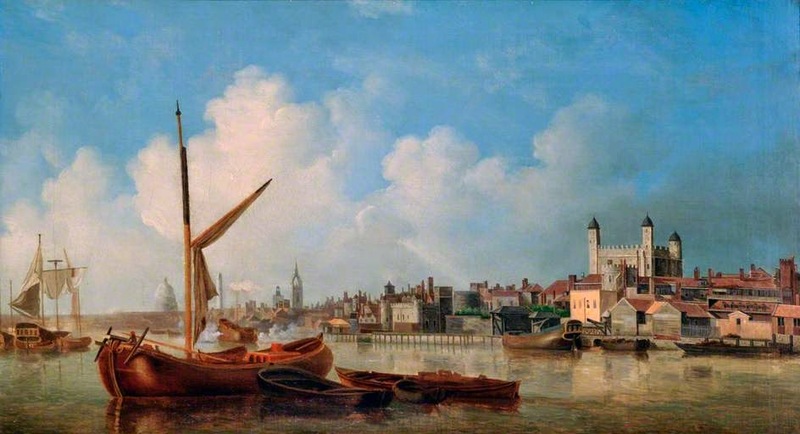 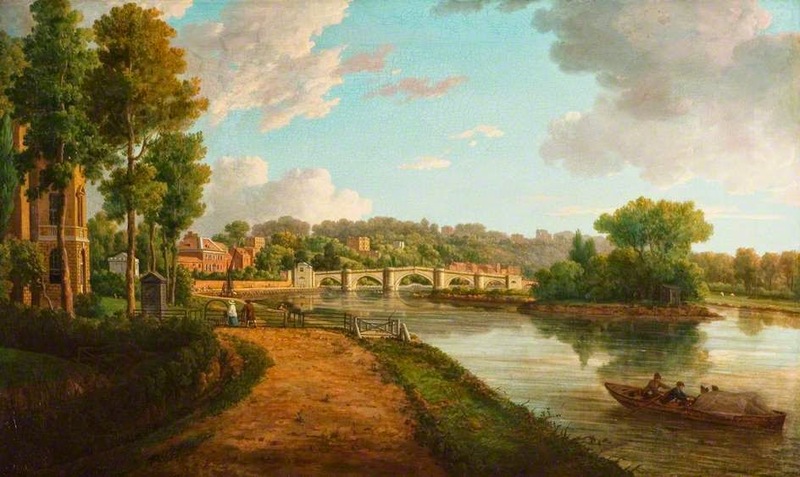 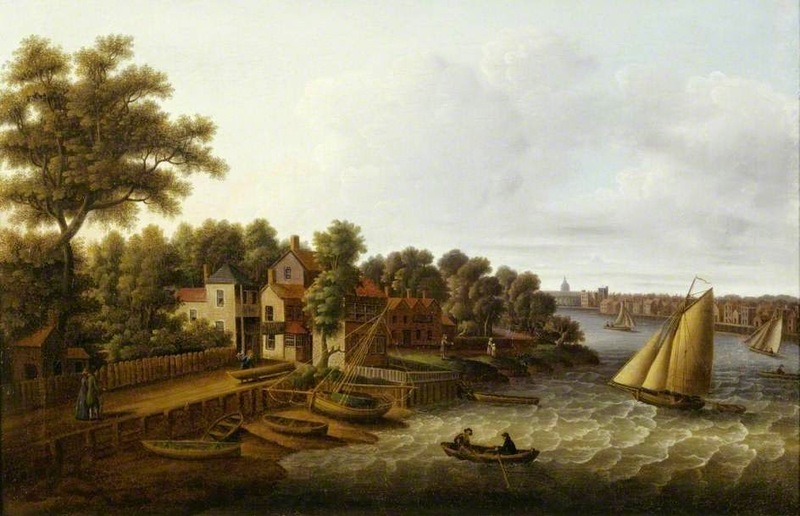 There are more paintings of the River Thames than I ever imagined, but as one goes through the inventory of works it becomes obvious why it's such an attractive subject. 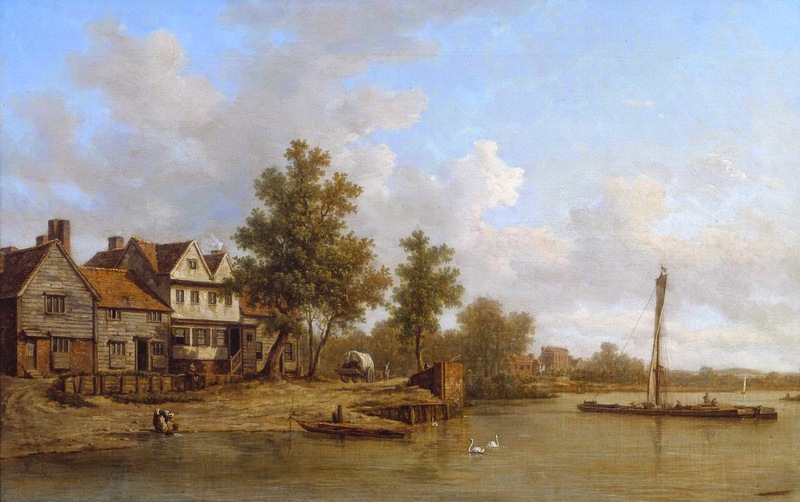 What has been interesting to note whilst researching these, is the changing face of the Thames - parts that are now considered central London are quite rural in the early works. 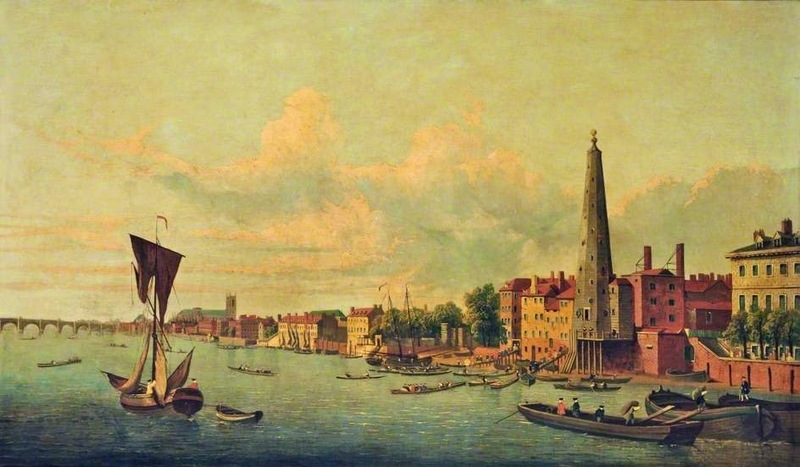 You can also note certain features like the York Buildings water tower, a wooden structure that was a dominant feature of the C18th London skyline, with echoes of 'The Shard' today. 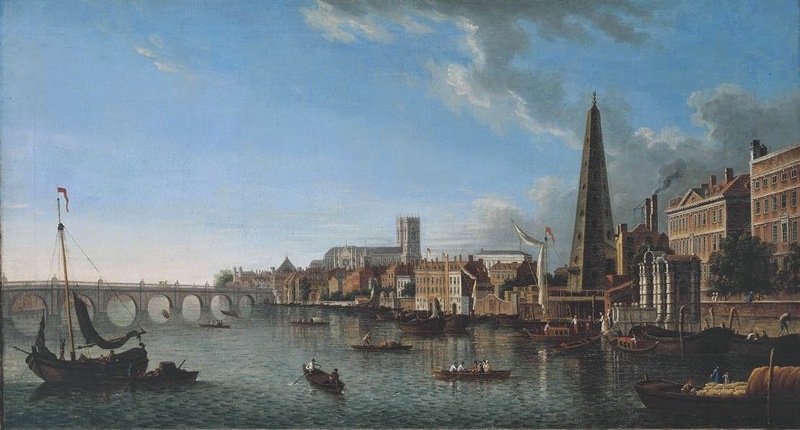 The tower was 21 metres high, with an octagonal cross-section. 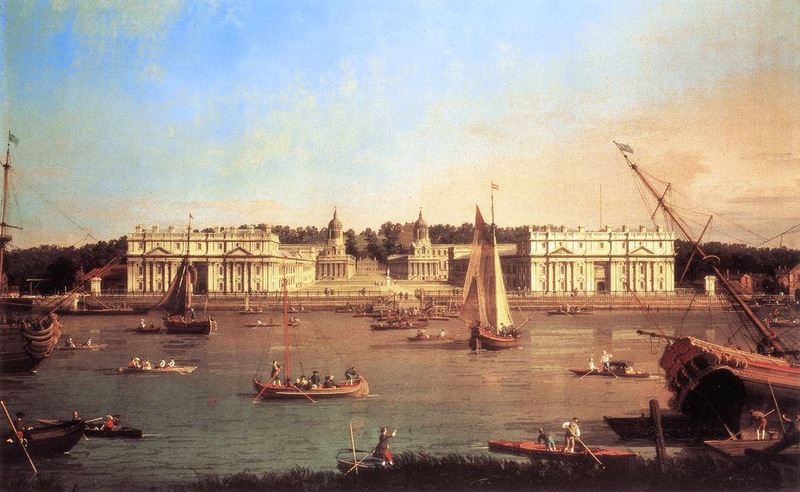 It was erected in the late C17th on a site at the end of Villiers Street, now part of the Victoria Embankment Gardens. 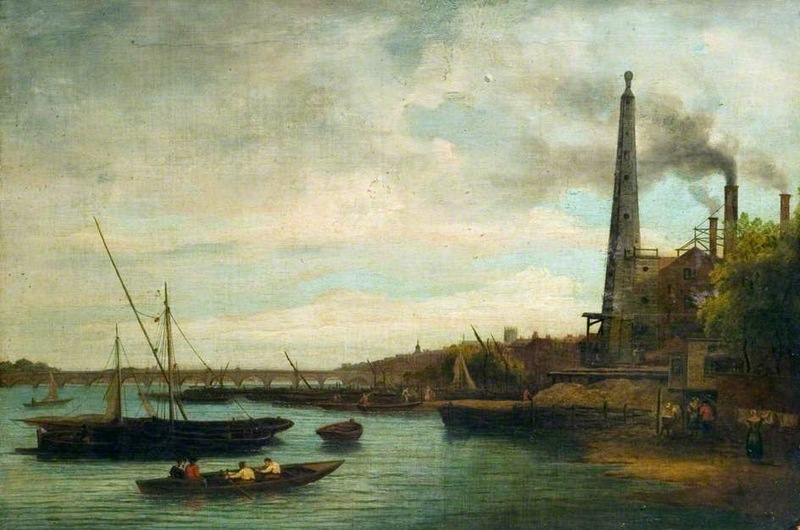 Another feature is Fowler's 'Horizontal' Windmill on the banks at Battersea. 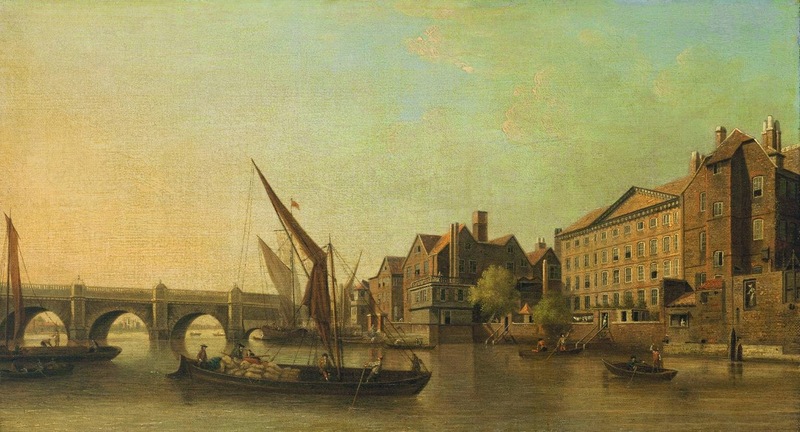 It was a working mill until 1825, when it was dismantled, leaving the substructure, which was used for milling as late as 1882. 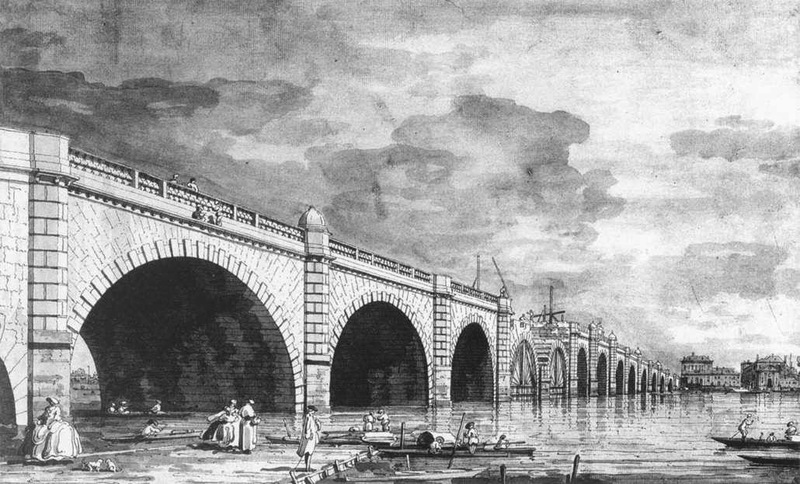 Another interesting aspect of the works is the record of London bridges - their construction, repair and renewal are widely featured. 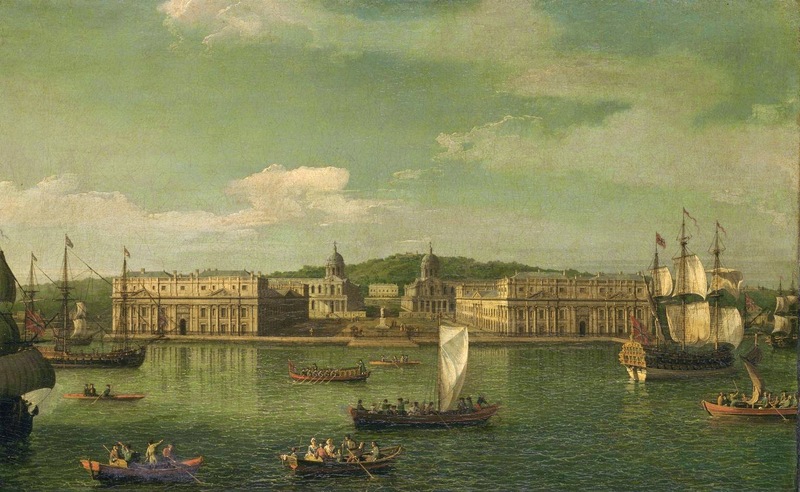 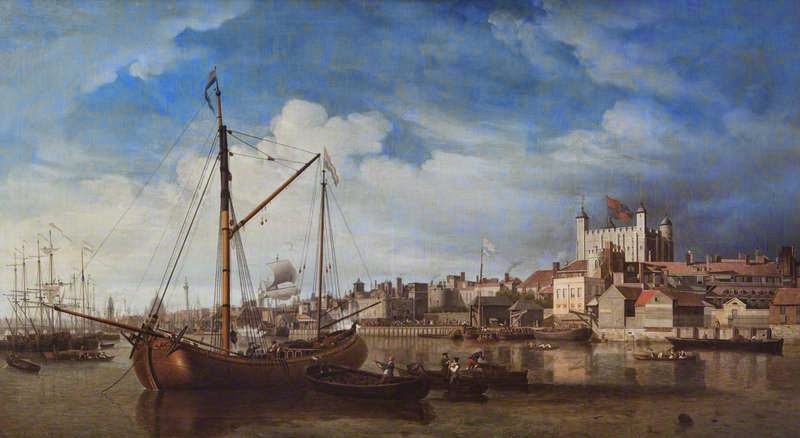 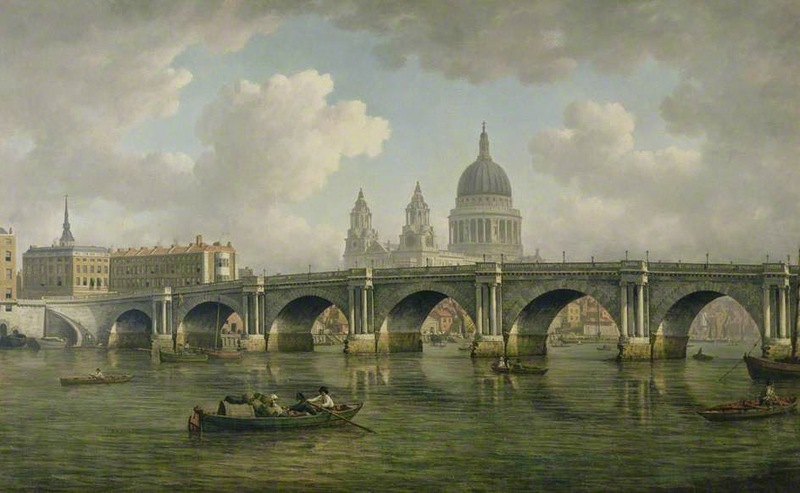 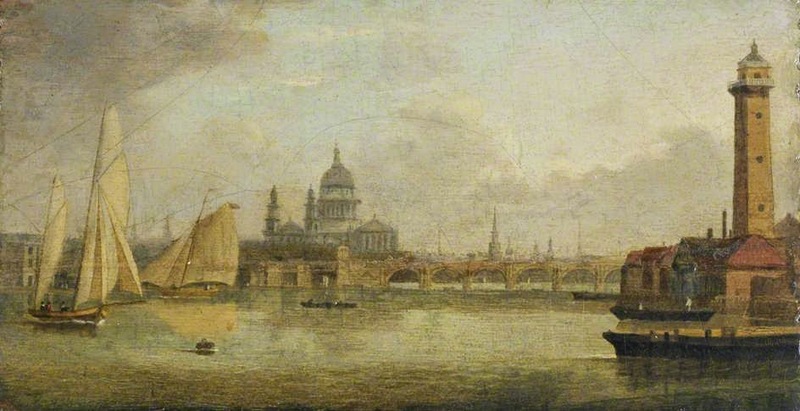 On the other hand the Tower of London and St. Paul's Cathedral sit unchanged in numerous paintings from one end of the time scale to the other. 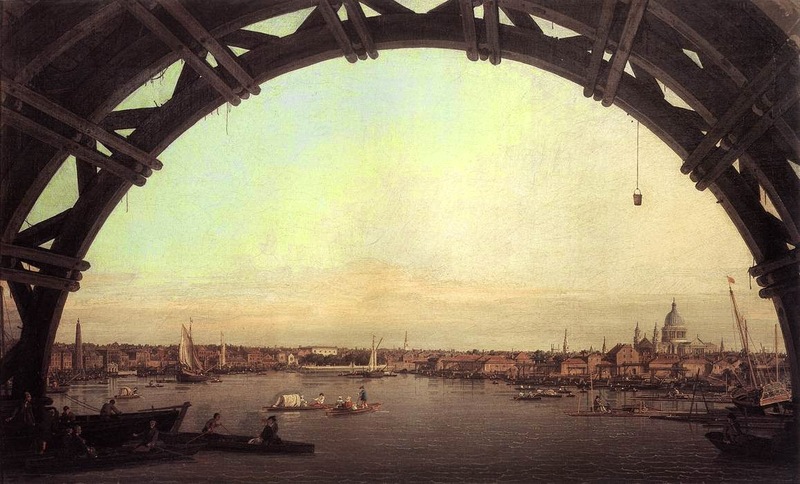 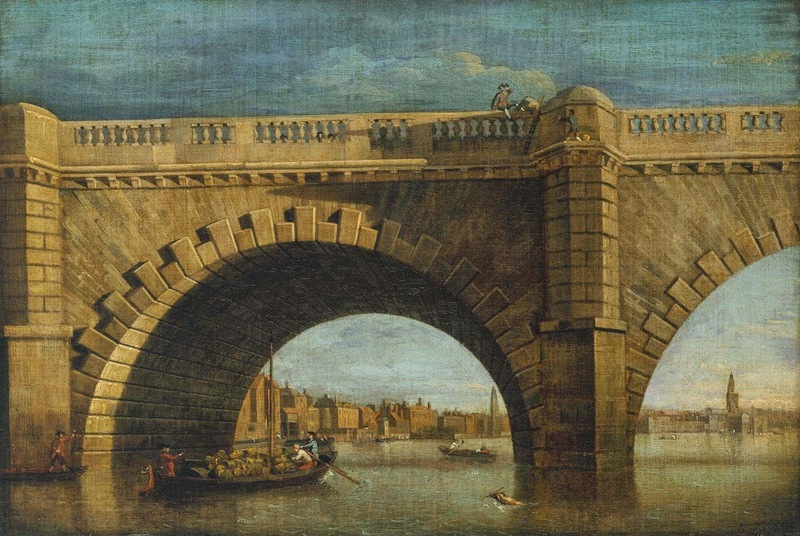 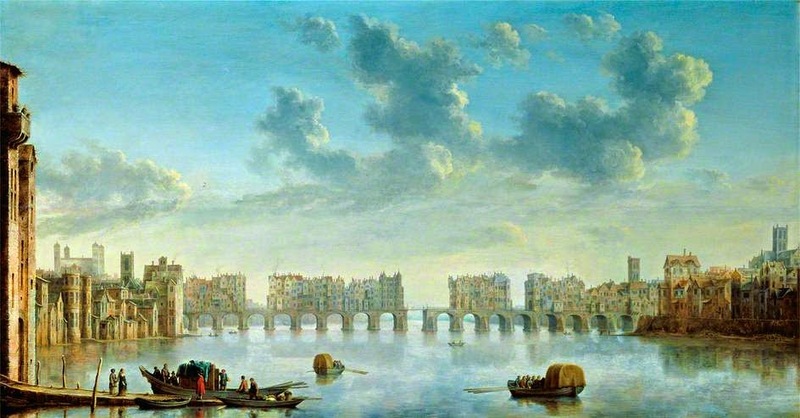 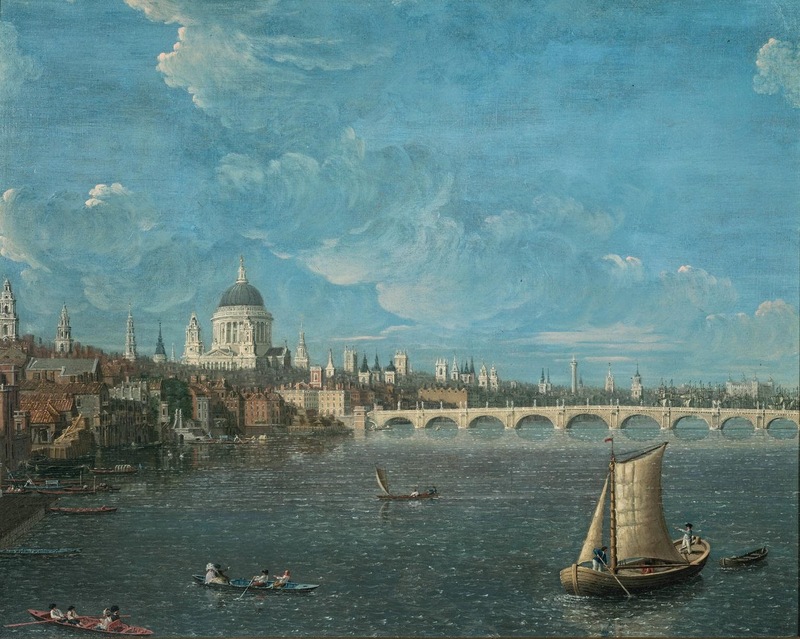 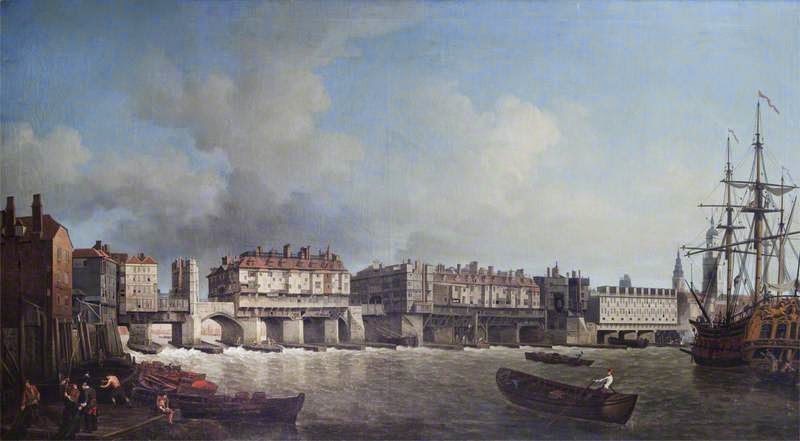 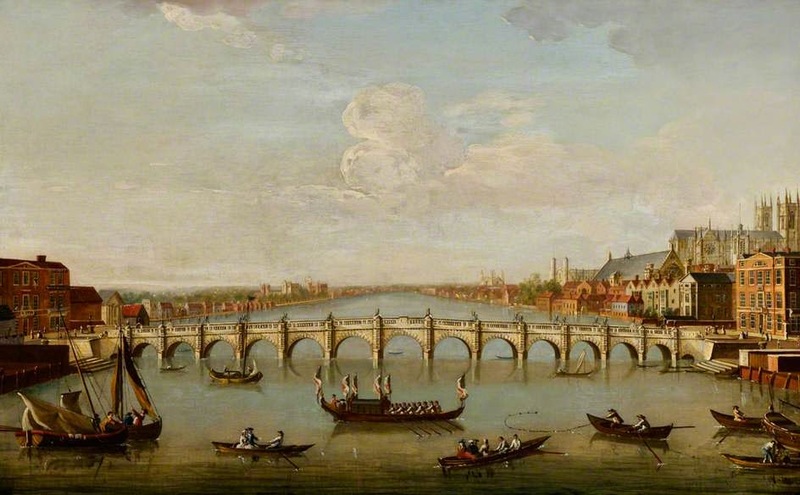 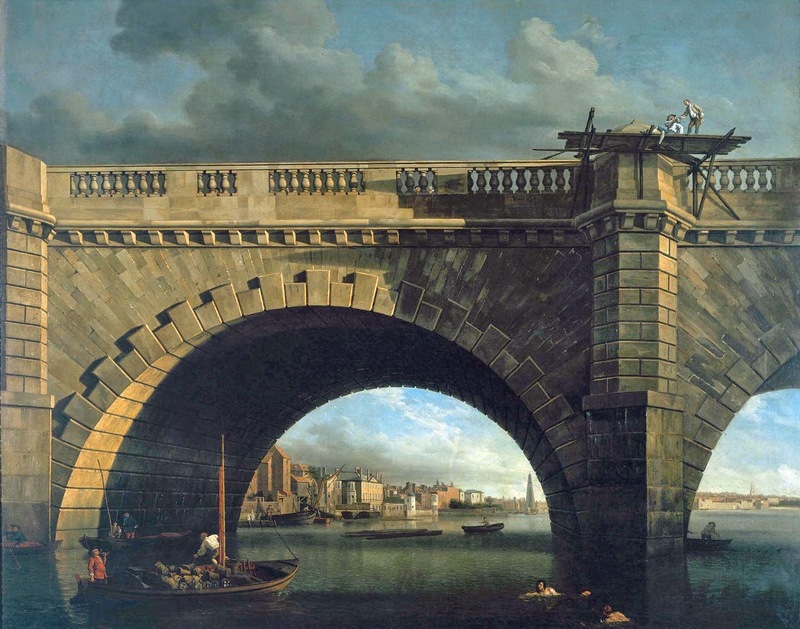 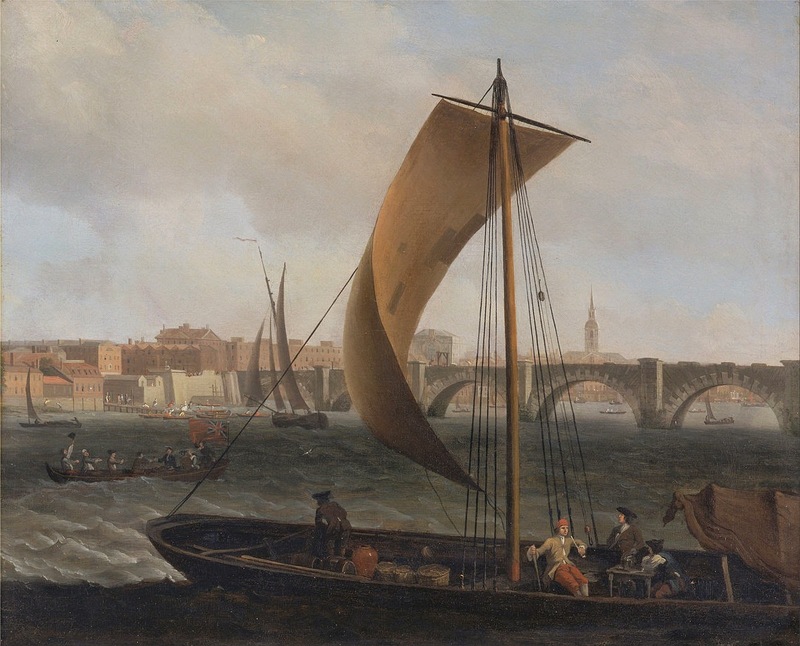 1650 Claude de Jongh "View of Old London Bridge from the West"
1684 Abraham Danielsz. 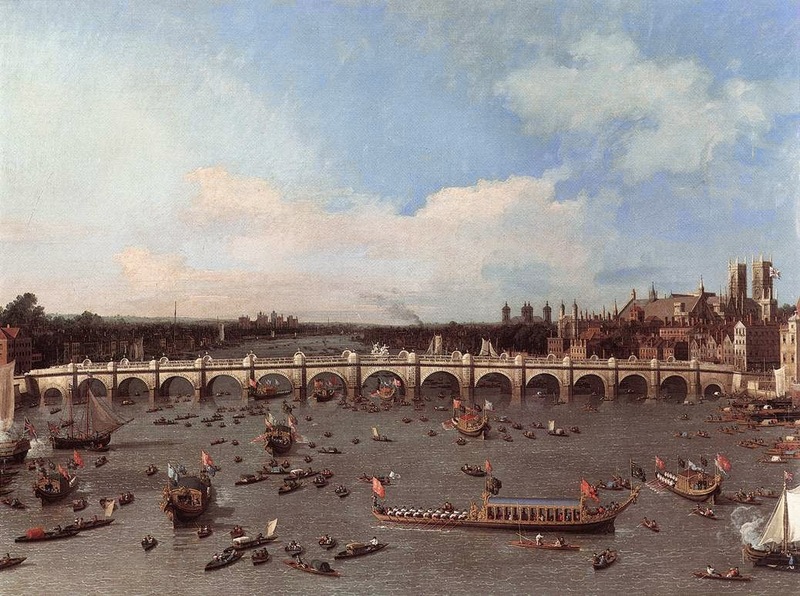 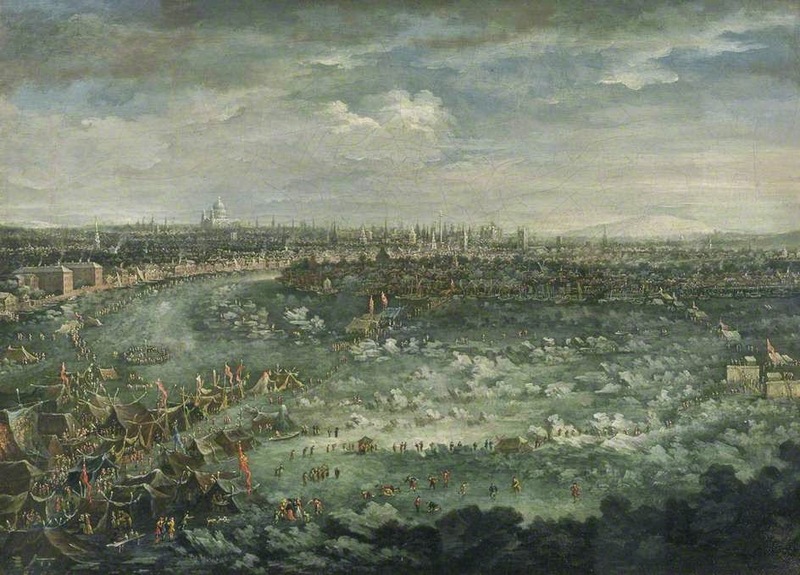 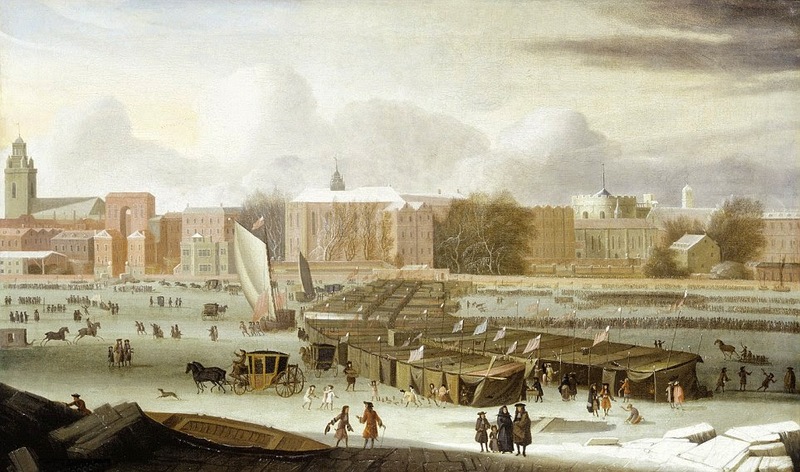 Hondius "A Frost Fair on the Thames at Temple Stairs"
1739 Jan Griffier "The Thames during the Great Frost of 1739"
1740 Joseph Nicholls "View of Westminster Bridge"
1743-44 Samuel Scott "View on the Thames with Westminster Bridge"
1744 Richard Wilson "Westminster Bridge under Construction"
1746 Canaletto "The Thames and the City of London from Richmond House"
1746 Canaletto "The Thames with St. Paul's Cathedral"
1746 Canaletto "Westminster Bridge from the North on Lord Mayor's Day"
1746 Samuel Scott "The Thames at Westminster Bridge with Barges"
1746c Canaletto "The River Thames with St. Paul's Cathedral on Lord Mayor's Day"
1747 Canaletto "London seen through an arch of Westminster Bridge"
1749 Canaletto "Westminster Bridge under Repair"
1750-52c Canaletto "A View of Greenwich from the River"
1750-65c Samuel Scott ( attributed to ) "The Thames with the York Buildings Water Tower"
1750c Samuel Scott "An Arch of Old Westminster Bridge"
1750c Samuel Scott "An Arch of Westminster Bridge"
1751 Canaletto "Chelsea from the Thames at Battersea Reach"
1752c Canaletto "Greenwich Hospital from the North Bank of the Thames"
1753 Samuel Scott "Old London Bridge"
1753c Canaletto "Greenwich Hospital from the North Bank of the Thames"
1758c Samuel Scott "A View of Westminster Bridge and Parts Adjacent"
1760-70c After Samuel Scott "A View of the Thames with the York Buildings Water Tower"
1760c Samuel Scott "The Thames at Twickenham"
1762 William Marlow "Blackfriars Bridge and St Paul's, London"
1765-90? 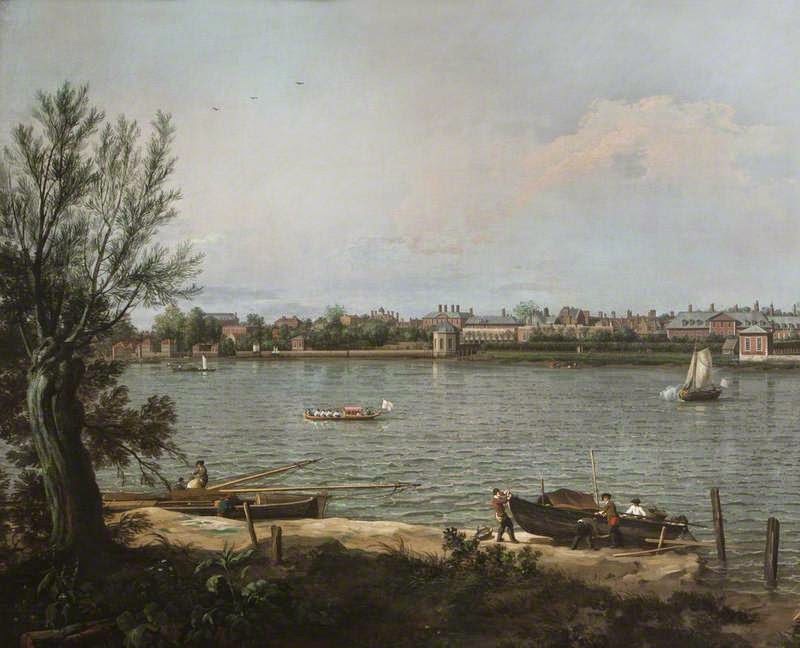 Style of Samuel Scott "The Thames with Westminster Bridge"
1769 Samuel Scott "The Pool of London"
1771 Samuel Scott "The Thames and the Tower of London"
before 1772 Samuel Scott "The Thames by the Tower of London"
before 1772 Samuel Scott "View on the River Thames near the Tower of London"
oil on canvas 49.6 x 90.4 cm approx. 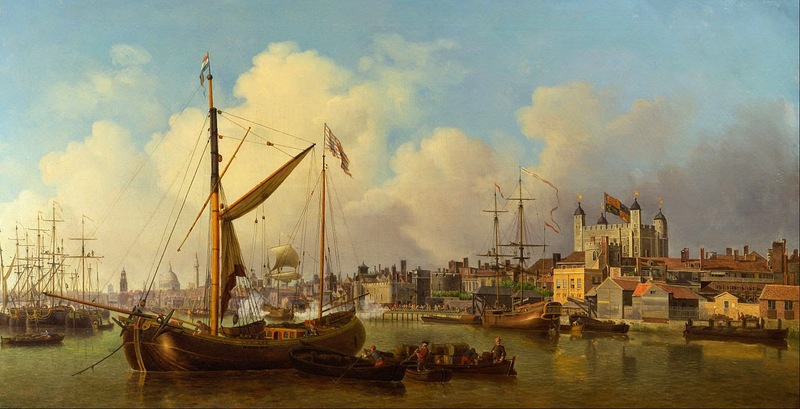 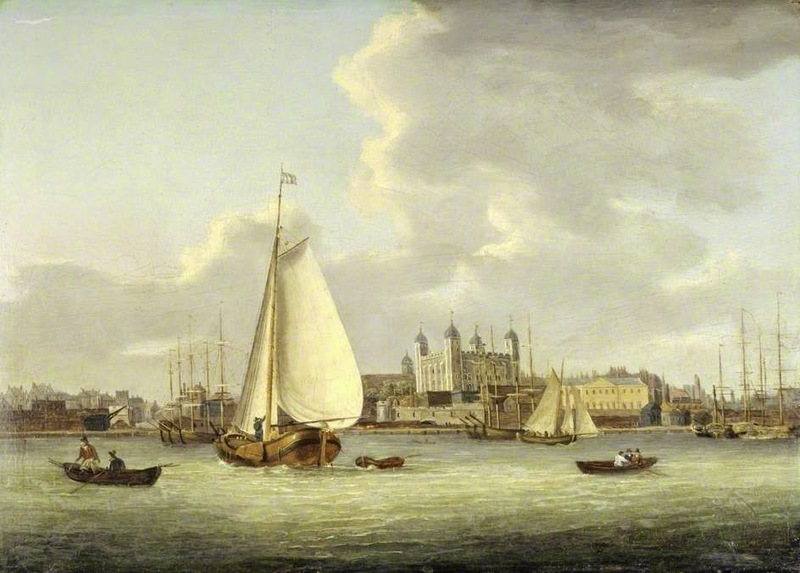 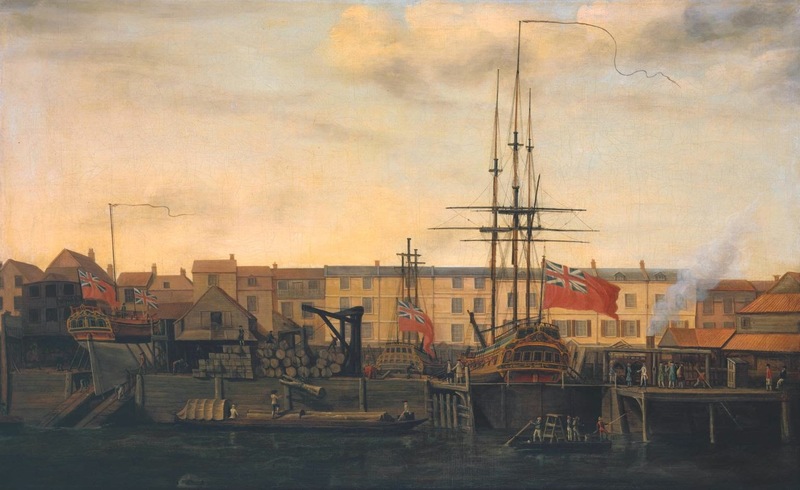 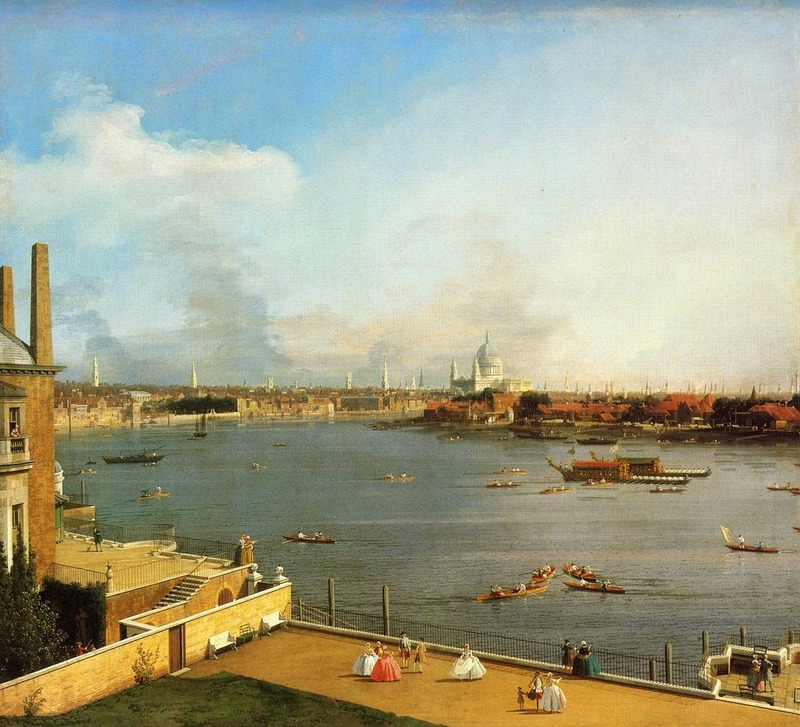 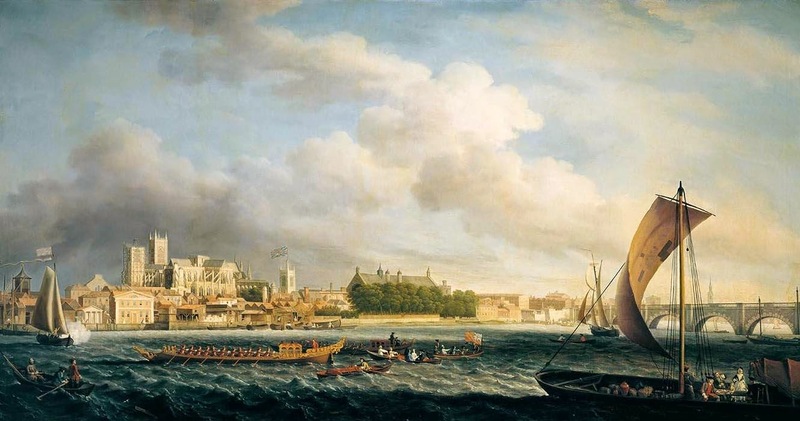 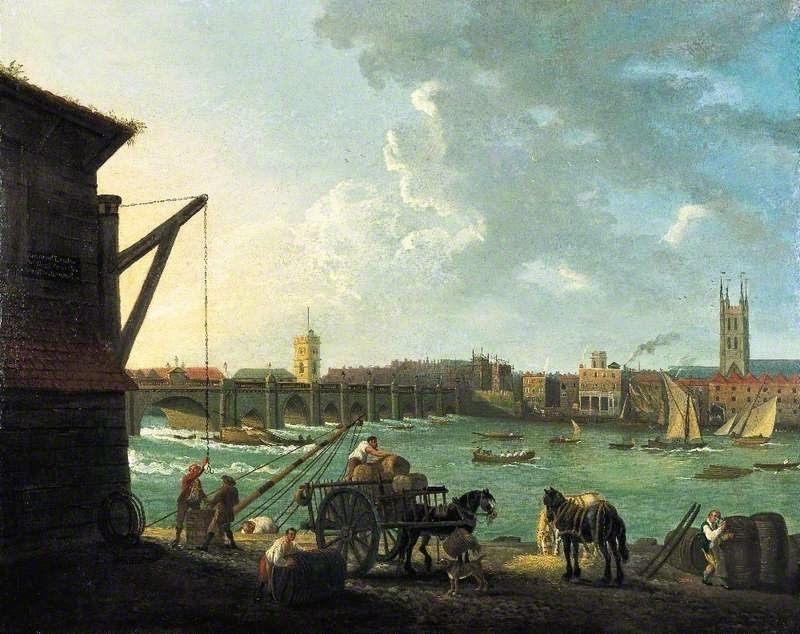 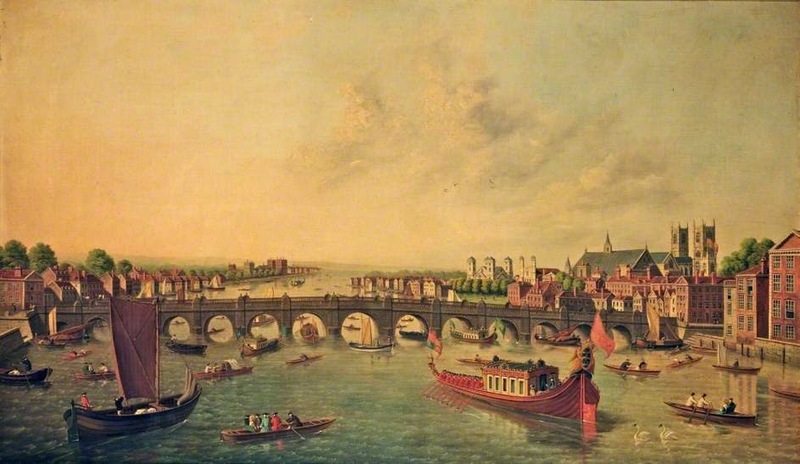 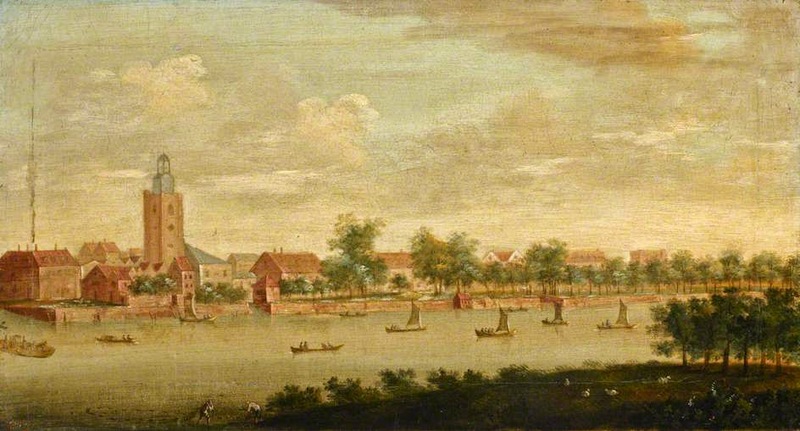 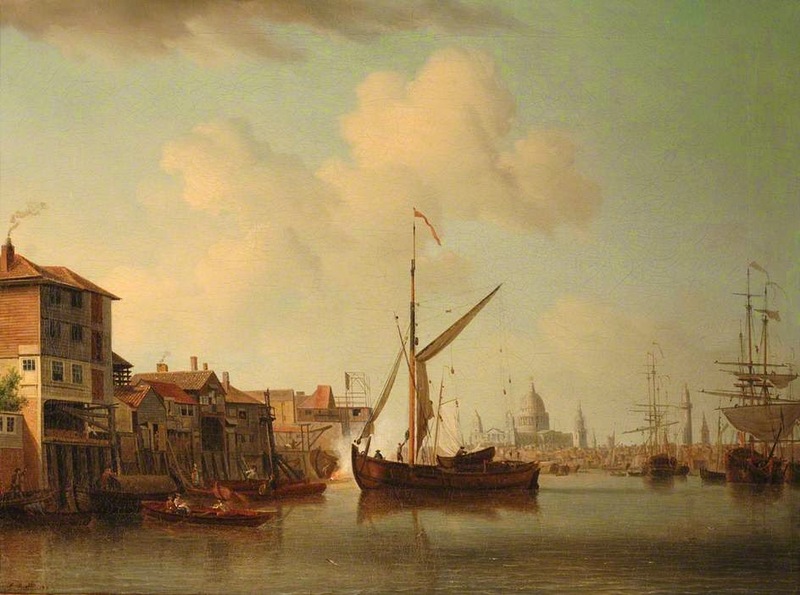 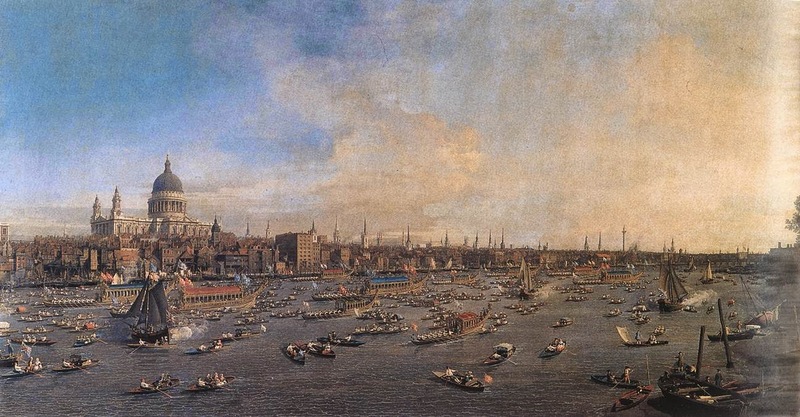 before 1772 Samuel Scott "The Thames: The Strand Shore and Westminster Bridge"
1774c William Marlow "Blackfriars Bridge and St Paul's, London"
1775c William Marlow "View on the Thames"
1780-84c Francis Holman "A Dockyard at Wapping"
1780c William Marlow "The Thames at Richmond"
1785-90 ( British School ) "The Thames at Millbank"
before 1788 Herbert Pugh "London Bridge from The Old Swan"
1790c Daniel Turner "View of St Paul’s from the Thames"
1791-1810 Daniel Turner "The Tower of London from the River"
1794c J.M.W. 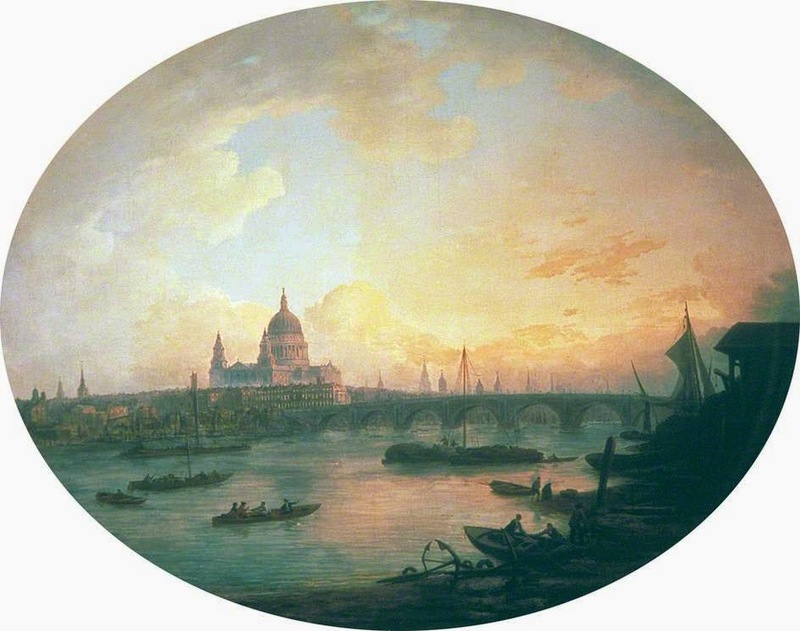 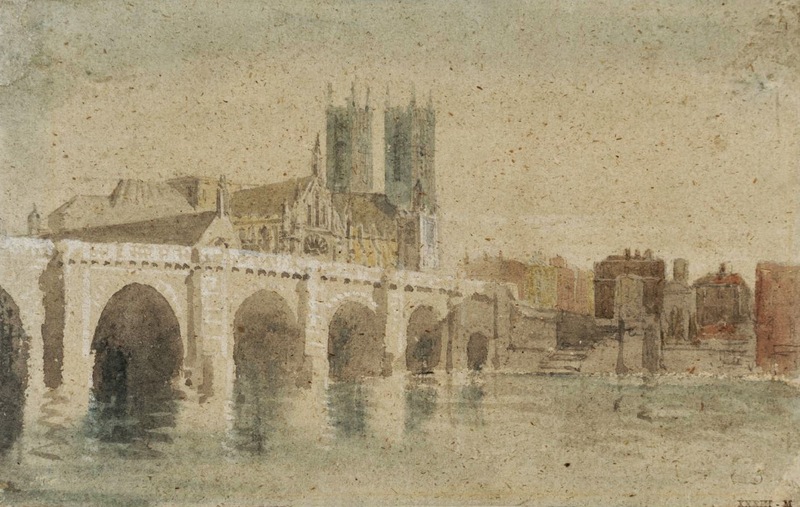 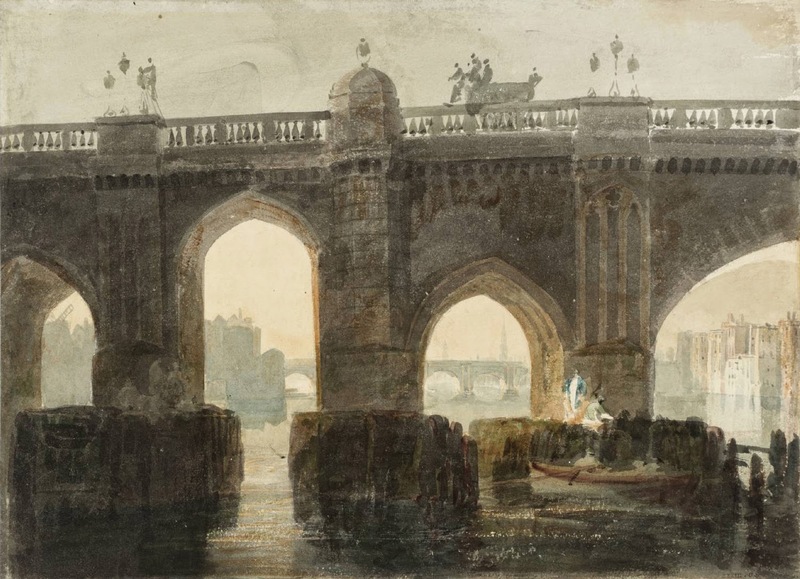 Turner "Old London Bridge"
1795-1802 John William Edge "St Paul's Cathedral across the Thames, London"
1796c J.M.W. 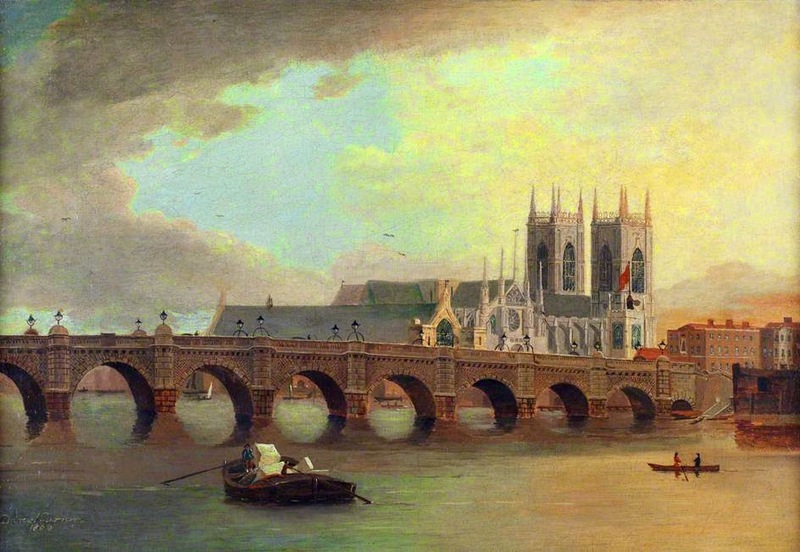 Turner "Westminster Bridge and Abbey from the North East"
1800 Daniel Turner "Westminster Bridge and Abbey"
1800c Daniel Turner "Southwark Bridge"
1801-10 Daniel Turner "Blackfriars Bridge and St Paul's from the Bridge"
Mr Webb, would you happen to know a place where I can purchase a (canvas) print of 'View of Westminster Bridge...' by Francis Danby? 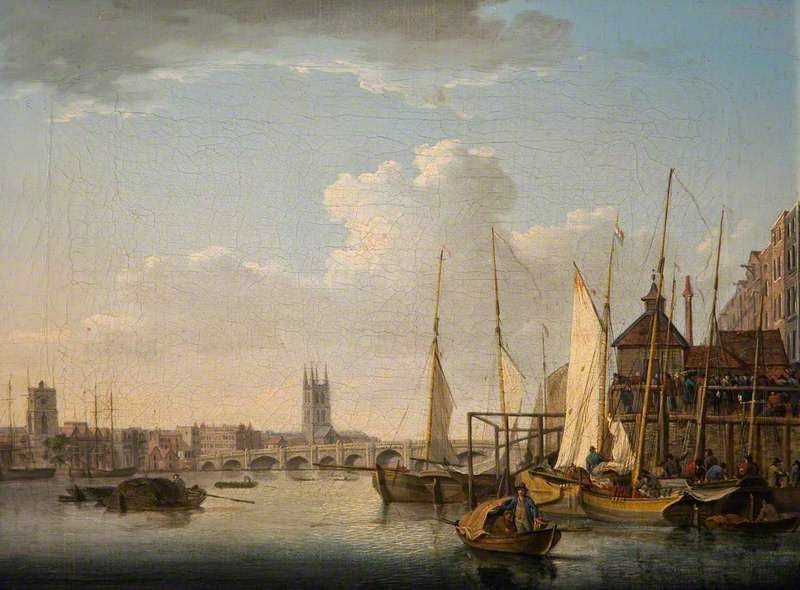 This is a fascinating collection, really well-researched; are you planning to publish a book on Thames paintings ?